This is my favorite non Super telephoto zoom lens in Canon's lineup. I have waited over a decade for the Series II to arrive. Placed my pre-order immediately. Here are some sample photos from Canon and an article from Canon Professional Network plus a technical discussion of the new lens. I am still on a Polar bear photo shoot with the Canon EOS-7D Mk II camera, giving it a good workout in an extremely cold and hostile environment. You can follow my shoot on Facebook. MELVILLE, N.Y., November 10, 2014 - Canon U.S.A., a leader in digital imaging solutions, today announced the highly anticipated Canon EF 100-400mm f/4.5-5.6L II USM lens, a second generation compact super-telephoto zoom lens featuring significant advancements in optical quality, image stabilization performance up-to-four steps, and rotating-zoom-ring design. This new L-series super- telephoto zoom lens features Canon L-series weather resistance and rugged magnesium housing to meet the needs of wildlife and sports photographers or photojournalists working out in the elements. Fully compatible with all EOS cameras, the EF 100-400mm f/4.5-5.6L II USM features a completely redesigned optical formula containing one Fluorite and one Super UD lens element ? a combination unique to lenses in this focal range ? to help deliver sharp images with high resolution and contrast. This combination of elements helps thoroughly suppress chromatic aberration throughout the entire zoom range. For photographers who want to work as closely as possible to their subjects, the minimum focusing distance of the lens has been reduced to just 3.2 ft. (0.98m), resulting in maximum magnification of 0.31x. The original EF 100-400mm f/4.5-5.6L IS USM was well known for its push-pull zoom adjustment, but the EF 100-400mm f/4.5-5.6L II USM uses a rotation-type zoom ring similar to the one found on the EF 70-300mm f/4-5.6L IS USM lens that allows for more precise adjustments, easier handling, and consistently excellent weight balance during handheld photography. In addition, the lens features an improved zoom torque adjustment ring that allows for the easy setting of zoom tension based on personal shooting preferences. The Canon EF 100-400mm f/4.5-5.6L II USM also features an inner focusing system, a powerful yet quiet Ring USM, a high-speed CPU and optimized auto focus (AF) algorithms for fast and accurate autofocusing in various shooting situations. 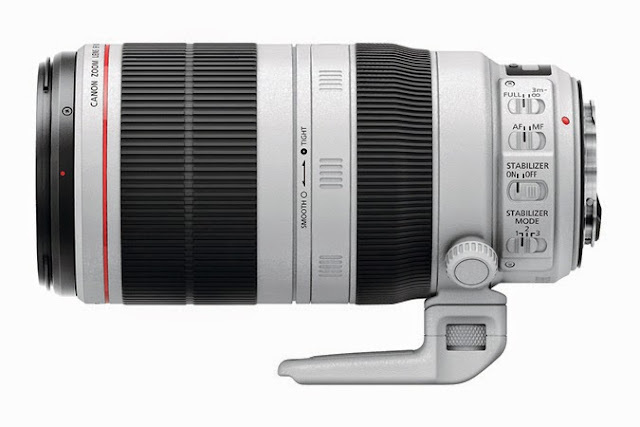 The Canon EF 100-400mm f/4.5-5.6L II USM features three Image Stabilization (IS) modes ? standard, panning, and during exposure only. Each IS mode is individually engineered to help provide outstanding results in a wide variety of shooting situations, and all serve to satisfy the personal preferences of photographers based on the type of IS they desire. The optical IS provides up to four shutter speed steps of correction, increased from 1.5 steps in the previous model*. In addition, the EF 100-400mm f/4.5-5.6L II USM features Canon’s newly developed Air Sphere Coating (ASC) which helps to reduce backlit flaring and ghosting significantly, as well as a 9-bladed circular aperture Electro-Magnetic Diaphragm that helps to enhance beautiful, softly blurred backgrounds.